This week, Hemby Bridge Elementary first grader Jonathan Page will experience a life-changing event as he fulfills his dream of meeting Golden State Warriors superstar Stephen Curry. Kindergarten students at Hemby Bridge went on an educational field trip to Hunter Farms where they learned about the foods we eat going through a process. Ms. Patrick, a third grade teacher at Hemby Bridge Elementary, enlisted in the Army in February of 1983 at the age of 19. Since that time, she has been deployed to the Gulf War and the Iraqi War serving many jobs through her almost 22 year career and working her way up the ranks to Chief Warrant Officer 3. At the time of her retirement, she left the Army as a specialist in combat logistics. After serving in the military, Ms. Patrick became a teacher. Ms. Patrick recently sat down with Mrs. Bossert to discuss her life in the Army. Hemby Bridge students recently enjoyed seeing cultural objects from a faraway country--India! Celebrating Read Across America with Dr. Seuss. Dr. Houlihan visits Hemby Bridge. Our kindergarten students and teachers celebrated the 100th day of school! 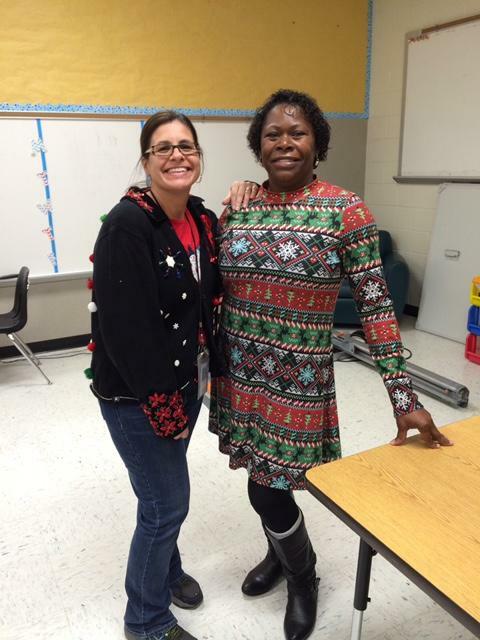 December 20th, Hemby Bridge Elementary School students and staff welcomed the start of winter break with their annual holiday attire day. Students and staff were ready to greet the holiday season with fun and festive creations. Competition was tough this year with the following categories of competition: Best Traditional Sweater, DIY Sweater, Most Sparkle and Tackiest Attire. From decorated trees, reindeer, elves and Santa, there was a surprise around every hall of the school. Friendly competition and the joy of the holiday season was experienced by all. Hemby Bridge Students Learned Computer Science During Hour of Code On Tuesday, December 6, Hemby Bridge students in every grade level participated in the Hour of Code, a worldwide event that has been called “the largest worldwide learning event in history”. First grade students began science discussing what they knew and what they thought they knew about fall in North Carolina. After discussing and making predictions they watched a video on the changing season patterns in the United States. We at Hemby Bridge are so excited to welcome our newest Visiting International Faculty member, third grade teacher Ellie Carruthers! Ms. Carruthers is from Hillingdon in West London. On Thursday, April 21, the ACC class participated in the Union County Special Olympics at Forest Hills High School. A much anticipated yearly activity, the students competed in various track and field events and returned to school having won several medals! This year provided a special opportunity for 5th grader, Hunter Rondina, who was chosen to help carry the torch for the opening ceremony. On Friday, 15th of April, 4th Grade went on a trip to Reed’s Goldmine. The children had the chance to explore different aspects of the goldmine through four activities. Panning for real gold was an exciting start to the trip. We started with pans of rocks and soil from the land around the goldmine. Our first task was to get rid of the soil and dirt from our pans by swirling water around the material. Next we had to remove the larger rocks; we then swirled our pans with water again and used the ridges on the side of the pan to sift the heavier gold from the other sediment. We found quite a few small pieces of gold – it won’t make us millionaires though, most of the pieces we found are worth less than a dollar! On March 18th, fourth and fifth grade AIG students visited the historic city of Charleston, South Carolina. Students learned about Charleston while enjoying beautiful weather and the antics of playful dolphins in the harbor, as well as an informative carriage ride through the old city. First grade teacher Becky Bossert did some research on the learning styles of boys and girls and realized that children needed movement to succeed. As an experiment, she decided to buy two stability balls and on a rotating basis had students sit on a stability ball during class. She discovered that students stayed focused on what they were learning because they were able to use their excess energy to control their movement on the ball. After seeing the success a couple of balls made in the classroom, Mrs. Bossert applied for a Donor’s Choose project and was fully funded for a classroom set of stability balls. Hemby Bridge Goes Global to Send Mrs. Burris to the Roof! During this year’s Boosterthon fundraiser students were given the opportunity to not only raise funds for the school and help the needy around the world but also to put our school principal, Stephanie Burris on the roof. Mrs. Burris agree to work on the roof of the school for a day if students obtained pledges from all 50 states. Students not only obtained pledges from all 50 states, but also many countries around the world, including. Germany, Peru, Kuwait, United Kingdom and Canada. Mrs. Williams' Fifth grade class adopted the country of Peru during Hemby Bridge Elementary's recent Boosterthon fundraiser. Students elected to become the "Happy Llamas". While participating in the fundraiser, students studied Peru and learned many facts specific to this country. During the month of October, first grade students learned about the history of the jack o’ lantern. They learned that the jack o’ lantern originated in Ireland and Scotland and were originally carved into vegetables such as turnips and potatoes. Immigrants from these countries brought the jack o’ lantern tradition with them to the United States of America. Americans thought that pumpkins, which are a fruit native to America, made the perfect lantern. On Tuesday, October 13th, the second grade went on a field trip to see the play Elephant and Piggie at Imaginon. Students had been studying Mo Willems and reading many of his books for weeks in preparation for the play. Research included learning about his daily routine which helps him get ideas for his books. Students also learned the step by step process of how his books are made. It’s one of our favorite times at Hemby Bridge; it’s Boosterthon! In addition to being a terrific fundraiser and a way to foster teamwork and healthy living, this year’s Boosterthon has a global focus as well. Each day, students are introduced to children around the world from a variety of cultures. In daily videos, these children talk about how they live and how demonstrating different character traits impacts their lives in positive ways. Fifth grade AIG students accepted the Great Library Challenge based on Chris Grabenstein's novel Escape from Mr. Lemoncello's Library. Hemby Bridge continues its tradition of global participation as we welcome Heather Greenwood, our latest member of UCPS’s International Visiting Faculty program. As every child knows, each new school year brings exciting changes and new faces. This year will be no exception at Hemby Bridge, including our new leadership team, Principal Stephanie Burris and Assistant Principal Sarah Starr.